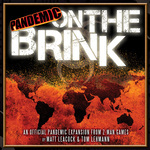 Description: This expansion to Pandemic includes new event cards, new role cards, rules for five players, and optional game challenges to increase the difficulty, such as the 'Legendary' difficulty level, the Virulent Strain challenge, the Mutation challenge, and the Bio-Terrorist challenge. These challenges can be mixed together to make the game even harder. Virulent Strain challenge: makes one disease become particularly deadly in unpredictable ways. Mutation Challenge: adds a fifth (purple) disease that behaves differently than the original four. Bio-Terrorist Challenge: pits one player against the others! You may also play with 5 players and play on Legendary level! Other components include: 12 purple disease cubes, 12 pawns in a smaller size, petri dishes to store your diseases and pawns, a bio-terrorist pad for that player to record his actions.